"The biggest challenge of the 21st century is the irony of technologies of abundance in the hands of those still thinking in terms of scarcity." ☮ October 2018: I re-dedicated the book Post-Scarcity Princeton in memory of a close friend from college who I recently found out passed away several years ago. ☮ April 2018: I ported StoryHarp from Delphi to the web using TypeScript, Mithril, and Tachyons. You can now run StoryHarp in your browser. ☮ March 2017: I put together a High Performance Organizations Reading List. ☮ January 2016: An essay on reasons not to use Slack for free software development. An email to Richard Stallman suggesting a campaign about a a pledge for foundations and non-profits to only fund and create free works. And here is a link to a no-doubt overly-long and overly-enthusiastic job application document as essentially a programming and FOSS autobiography intermixed with ideas about how what I had learned over the years could help Automattic (the main developers of WordPress) -- or, to some lesser extent, any other large FOSS effort, including Drupal/Acquia. After waiting a couple of months in the Automattic interview queue, that application fizzled over whether I was willing to use Slack for the job interview at Automattic. My reason for concern over Slack use at Automattic was that, as good as Slack is, the proprietary venture-funded Slack is disrupting the open-source communications ecosystem which WordPress is a big part of. I enjoyed writing that application document overall, and I still hope some of the ideas in it can still help Automattic grow even more in a FOSS direction (or other similar companies like Acquia with Drupal). That document is at least something for my kid to perhaps read someday many years from now. Of course, my kid may just read it and then say, not without significant justification, that I probably should have put the principle of family ahead of other principles in turning down any significant chance for a six-figure salary work-from-home job on FOSS. :-( We always have many principles to choose from, and it can indeed be hard sometimes to get the priorities right. As Scott Berkun (who left Automattic after a year to go back to writing full-time) wrote, even in a metrics-driver organization like Automattic, there is no metric for picking metrics or deciding how to weigh a variety of metrics (beyond perhaps survival itself). Here is a version of Twirlip I started as a proof-of-concept Thunderbird Server webapp to handle email, chat, and other real-time communications as another step towards a social semantic desktop. It is the beginning of the embodiment of the "ThunderbirdS Are Grow! Manifesto". But if you are looking for something good now that is FOSS, check out Mattermost, Matrix.org, Mailpile, Kolab, and similar things. Here is an essay called ThunderbirdS Are Grow! Manifesto -- Thunderbird Server as a Way Forward for Mozilla. ☮ November 2015: An essay by me on Why Encryption Use Is Problematical When Advocating For Social Change. I finally got around to putting this (unsuccessful) DARPA proposal from 2011 up on: Participatory Sensemaking about Real-Life Cyber-Security Stories with Rakontu 2.0. Peter Neumann of RISKS Digest actually liked the idea and suggested I post it to RISKS Digest, but that was just before I started contracting at NBCUniversal, so the idea got stalled on my side with my becoming busy with a new job. ☮ 2013: An essay by me on how abundances can create scarcities and other challenges. ☮ 2012: I made a copy on this website of a knol I created on "Beyond a Jobless Recovery: A Heterodox Perspective on 21st Century Economics" because Knol is shutting down soon. Here is an insightful essay about a national dividend (basic income) from April 2007 by Richard C. Cook (a retired federal government analyst who worked for the U.S. Civil Service Commission, the Food and Drug Administration, the Carter White House, the U.S. Office of Consumer Affairs, NASA, and spent 21 years with the U.S. Treasury Department) on: An Emergency Program of Monetary Reform for the United States. A related six-part video series by him: Credit As A Public Utility. Some stuff about a workshop for Capitol Camp 2011 on Back to the (federated social semantic mobile future) desktop for eGovernment? The workshop is archived here with video: Desktop or Mobile or Web. Another workshop I ran there: Tools for Collective Sensemaking and Civic Engagement. 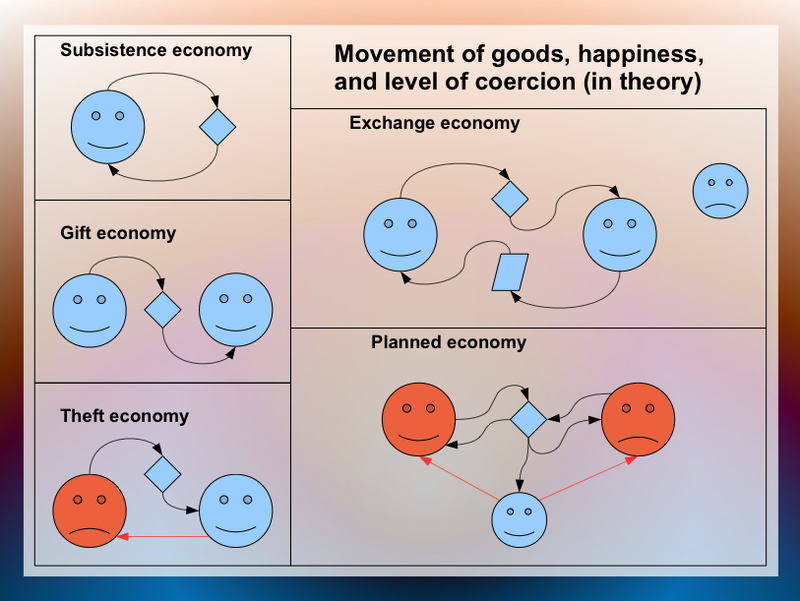 Diagram showing five types of economic transactions: subsistence, gift, planned, exchange, and theft, where red indicates coercion, and smiley faces indicate if someone is happy with the situation or not. A summary of my thinking on socioeconomics and abundance is currently here and extended here. * A subsistence economy. This involves production directly for ones own group, like gardening or hunting and gathering. For example, "There’s some lovely berries over here." * A gift economy. This involves voluntary contributions to individuals or a community, like volunteering at a hospital. For example, "The meat from this deer I hunted is going to spoil; I'll share it with the tribe, and others will share their hunting results some other time as they have in the past." * A planned economy. This involves a group deciding to do something together, with failure to participate as told by the group generally met with some penalty (whether shunning, exclusion, imprisonment, or violence). For example, "Let’s put the longhouse here. I'll cut the trees, you level the ground, you over there will put up the walls, and you over there will cook us some food while we are busy with these other tasks; if you don't help, you can't live in it and no one will ever talk to you again or have anything to do with you socially." * An exchange economy. This involves purchasing something for money or bartering something for something else. One complex but current example is "purchasing" a Smartphone at a website that can store all the music you could listen to in a lifetime in exchange for flipping a few bits in a banking computer that somehow relate to a specific amount of pieces of paper with fancy printing on them which for some reason we all agree means something. For a simpler example, "You scratch my back, I’ll scratch yours. I'll trade you some of my extra berries for some of your extra deer meat." * A theft (or conquest) economy. This involves someone breaking the social norms for the above other types of transactions and taking what they want against the wishes of someone else. This can also be thought of, to a lesser extent, as someone "stealing" from the future, by staking out a formal claim to something on the logic of "finders-keepers", when other people who come later might want to share same resource but will be denied access based on claims related to ancient history backed by some form of "defense". For example, "What's yours is now mine because I'm stronger, cleverer, sneakier, faster, older, or can afford better lawyers, so hand over your digital watch or there will be trouble." It is rare that any transaction is purely of one sort, in the same way that one color of paint may be a mix of other colors. For example, an exchange transaction might have some gift component of good will about a merchant who gives back to the community voluntarily. Subsistence production is generally based on a claim to physical resources like who gets to a berry bush first, and knowledge of how to make things may be a gift from the past. A country with a planned economy may have taken the land from indigenous people who had a gift economy and may ration things using some form of currency. And so on. And it is common that a transaction has "externalities" where other individuals are helped or harmed who are not party to the transaction (one reason governments get involved in exchange transactions is to regulate such externalities such as pollution). So, these "cartoonish" ideas are to help people think better about economics as far as what is possible as far as alternatives, not as clearly-defined absolutes. * the emergence of voluntary social networks. * Minimizing the impulse to theft (or conquest) and related violence through the previous four changes. The particular balance a society adopts is going to reflect the unique blend of history, culture, infrastructure, environment, relationships, mythologies, religions, and politics of that society. A central irony of our times is that our major social institutions revolve around the idea of rationing "scarce" resources, but the technology of the 21s century has the potential to make most resources very abundant. So, our policies relating to areas as diverse as education, welfare, healthcare, economics, infrastructure, research, urbanization, transportation, communications, copyright, patents, and agriculture are built on increasingly obsolete conceptual foundations. Understanding this big picture is all part of rethinking socieoconomic institutions for the 21st century based on new (yet old) paradigms. 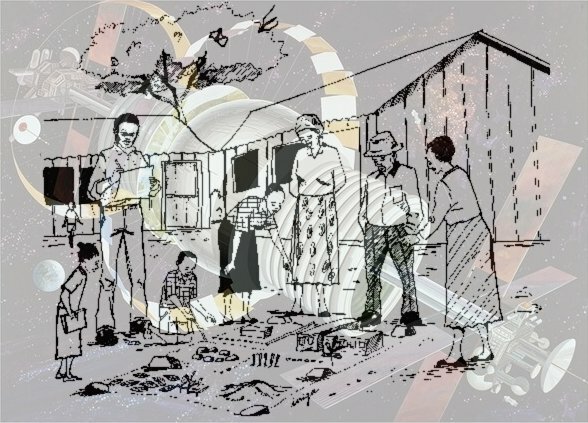 Here is a PDF file I created with a presentation on Five Interwoven Economies: Subsistence, Gift, Exchange, Planned, and Theft. Here is a 12 minute YouTube video by me of that presentation. Rethinking social institutions as a global mindshift for the 21st century is the pressing challenge facing both citizens and governments, and what we hear in the news is a derivative of these enormous social changes playing out (sometimes slowly, sometimes quickly). Citizens face these issues in their own private lives trying to get by day-to-day, and citizens also must decide how to vote about these sorts of issues, or decide whether to petition their governments, or decide whether run for office to make changes about them. Governments face these issues because they regulate all these types of transactions and also engage in most of these transactions in various ways. So, how can citizens and governments make sense of all these changes? How can can citizens and governments have more productive interactions about this challenge to rethink economics for the 21st century and deal with these ongoing social changes? The old tried-and-true way is to have face-to-face public meetings about issues and to have committees of selected individuals publish policy reports. But are those old ways up to wrestling with these new challenges? How do they relate to the ongoing shift in our society towards increasing internet use? Along with many other people, I have been working towards better tools and ideas to help with that challenge. Wonderful things can be created using the tools and ideas at hand, even if they are just sticks and stones. Sometimes simple and direct is better than fancy, as Karl Kehde has shown in his success with land use planning using maps and wooden blocks. We should use the right tool for the job at hand. But as our needs or ambitions grow, sometimes we need better tools as well to help us learn about and manage complex systems. Douglas Engelbart talked about a "co-evolution" of communities, tools, knowledge, and processes. The current first and best tool for learning and managing these days will always be the human mind and imagination. As Douglas Engelbart suggest, the question is how to "augment" that in a health way? A variety of such tools have already been created at tax-payer expense by the intelligence community, various government agencies like NASA, tax-subsidized academia, other non-profits, and consumer-funded businesses. Most of these tools are not accessible to the general public, although a few are. Examples of tax-funded tools that are not accessible are SRI's SEAS and Angler, and Singapore's RAHS (all three of which were derived in-part from US DARPA and ARDA funded work, two of which my wife and I have contributed ideas or code towards). Examples of tools that are available as free and open source software are the Open University's Compendium and Cohere concept mapping tools and our Rakontu software, but there are many others (including the entire Drupal software ecosystem and similar platforms). While it is unlikely the previous proprietary software will likely be made free in the near future, many of the key ideas in them are published and so can be duplicated in a free system to help groups of people collectively make better decisions. 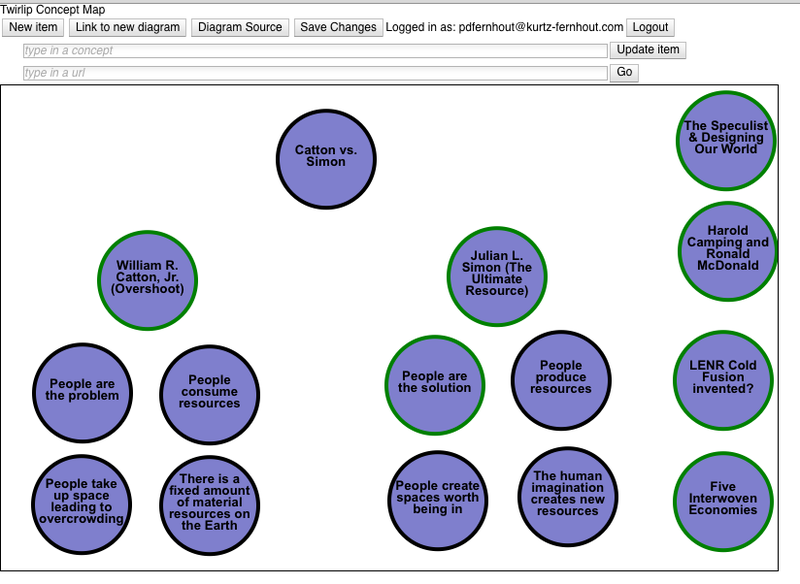 Here is a wiki page I put together for a workshop at Capitol Camp 2011 listing a variety of tools and related ideas. * support for small issue-oriented groups focused on a location or a concern. * help synthesize multiple stories and perspectives into a rich tapestry of shared and interconnected meaning that a citizen group or an elected official can make sense of and act on. My wife and I have software development skills, some domain knowledge about various topics (including health, manufacturing, economics, sustainability, and space), and various experiences with helping groups to work with their own stories. Our hope is to continue to bring these all together with current needs to create better tools and infrastructure for everyone for learning, understanding complex issues, discussing them together, and making better plans about the future. As I suggested in response to a public call for ideas by the President's Council of Advisors on Science and Technology, all citizens and citizens groups in a democracy need to make better sense about what is going on in order to sustain a health society. As Scott E. Page wrote about in his book "The Difference: How the Power of Diversity Creates Better Groups, Firms, Schools, and Societies", a more diverse group can often solve problems a less diverse group gets stuck on, because a variety of perspectives is generally beneficial for creative problem solving. As Hugo Mercier and Dan Sperber have suggested in their "argumentative theory of reasoning", the function of human reasoning is so groups can collectively get closer to the truth and to good decisions for the group. Yet, as Michael Sandel talks about we need to relearn the art of democratic debate in our society that has drifted too much into partisanship instead of partnership. As time permits, both of us continue to work towards creating mare information and better tools to support this collaborative process. Here is my own take on what is going on right now in our society. Obviously, it is limited by just being one person's perspective. An it no doubt has its flaws. Hopefully people working together with better tools, or even just the great tools we already have with the internet, will produce even better summaries. Of course, part of the issue is that summaries about socioeconomic issues and politics are themselves political. As Deborah Stone write in "Policy Paradox: The Art of Political Decision Making, Revised Edition", "you can’t take politics out of analysis" because real-world policy grows out of differing ideals, even definitions, of basic societal goals like security, equality, and liberty. Still, we can hopefully do better than we have today. There are good ideas in all political parties. There are also bad ideas in all political parties. It can be hard to sift through that all to come up with some healthy mix that makes sense for our society right now and in the near future. The following is informed by insights from people like Marshall Brain, James Albus, Martin Ford, Jane Jacobs, Charles Fourier, Richard Wolff, Richard Stallman, Albert Einstein, Morton Deutsch, Alfie Kohn, John Holt, Joan Roeloffs, John Taylor Gatto, Steven Slaby, Ursula K. Le Guin, James P. Hogan, Elizabeth Warren, Amelia Tyagi, Ivan Illich, Michael Mahoney, Freeman Dyson, Ted Taylor, Douglas Lisle, David Goodstein, Michel Bauwens, Eric Hunting, Kevin Carson, P.M. Lawrence, Iain Banks, Harvey Cox, G. William Domhoff, E.F. Schumacher, Jacque Fresco, Stewart Brand, Buckminster Fuller, Dee Hock, Michael Phillips, Amory Lovins, Hunter Lovins, John Todd, Nancy Jack Todd, Manuel De Landa, Kenneth Rogoff, Carmen Reinhart, Gerard K. O'Neill, Frances Moore Lappe, David Brin, K. Eric Drexler, Hans Moravec, Victor Serebriakoff, Noam Chomsky, Herbert Simon, Robert Steele, Julian Simon, Larry Slobodkin, Patrick Grim, Philip Zimbardo, Slavoj Zizek, Dan Pink, Alan Kay, George A. Miller, Lev R. Ginzburg, Norman Spinrad, Gene Roddenberry, Alvin Toffler, James R. Beniger, James T. Liu, Alain Kornhauser, Jennifer Morgan, Juliet B. Schor, Marshall Sahlins, Suniya S. Luthar, as well as all the authors of the 1964 Triple Revolution Memorandum, and many, many others. If I can see so far, it is from "standing on the shoulders of giants", none of whom should be blamed for any errors in the following that are solely my own. Mainstream economists have created a beautiful body of mathematical thought based on several key assumptions that has resulted in elegant equations worth admiring for their own sake. There is just one big problem with mainstream economics. Many of the assumptions are questionable. So, the mainstream equations in reality can produce divide-by-zero errors, such as when the value of human labor goes towards zero, or the cost of energy or information goes towards zero, or as supply of goods and services exceeds demand on a long-term basis and profit goes towards zero and the system freezes up. Mainstream economists try to ignore these long term trends and divide-by-zero problems by assuming infinite demand. But infinite demand is just not in accord with healthy human psychology or the social dynamics in a healthy self-reflective society that cares about its future. See Maslow’s Hierarchy of Needs. Or think about the emerging “Reduce, Reuse, Recycle” ethic. Or see any of the world’s major religions — including humanism — about moving beyond materialistic values. So, mainstream economists' assumptions about demand always outpacing productivity increases are questionable. There remains some truth in them within limits, but not enough to prop up their entire mathematical house of cards in a hurricane of widespread social and technological change including robotics, 3D printing, nanotechnology, better design, AI, cheap communications, dirt-cheap solar panels (predicted), cold fusion (maybe), and voluntary social networks. Mainstream economists also assume that robotics and AI can never replace most human labor in structured settings like warehouses, offices, and greenhouses. Ironically, as Martin Ford has mentioned, military planners are at the same time working towards robots that can function in unstructured battlefields. Which is it? Are robots going to be better than humans in unstructured battle settings or are robots always going to be less capable than humans in structured workplace settings? Even if the truth is in the middle, perhaps that robots will soon be fairly capable in a wide variety of semi-structured settings, that middle-ground is enough to break the income-through-jobs assumption so much of US society rests on. Whatever the demand for stuff is, if robotics and AI and 3D printing can produce things cheaper, better, and more reliably than humans, then there will not be much of a market for most human labor (even as some rarer skills may still be in great demand). If voluntary social networks emerging through the internet can produce intellectual "milk" for free, why pay a person to produce, say, newspaper articles in-house? There may remain some reasons, but more and more, such reasons become about things like guarding and creating "artificial scarcity". Those approaches to organizing a society will ultimately begin to feel more and more dysfunctional in an age of abundance (even as there may always be some reasons to guard or filter, and there is truth that an abundance of one thing can sometimes create a complementary scarcity of something else). There may still be ways production is coordinated in the future, like through emails, blog posts, and twitters, or via equivalents within networks of AIs and robots, maybe even entailing moving Kanban tokens as "funny money", but the flow of fiat dollars (ration units) that so defines much of our society will likely become much less important in such a future. "This planet has — or rather had — a problem, which was this: most of the people living on it were unhappy for pretty much all of the time. Many solutions were suggested for this problem, but most of these were largely concerned with the movement of small green pieces of paper, which was odd because on the whole it wasn't the small green pieces of paper that were unhappy." But our society currently depends on an income-through-jobs link for distributing the right to consume (for the vast majority of the population not living off the interest from capital ownership). Further, even if there is a demand for human labor, the growing rich/poor divide with the centralization of wealth also ensures that human laborers are at a huge disadvantage in negotiating wages, including by competing with each other with the law of supply and demand. Real wages for most workers have been flat for decades in the USA, and actually declined in the 2000s. Potentially, in an advanced economy, laborers can be forced to accept less than even subsistence wages. The difference is made up by workers being forced to consume or erode various non-currency capital the have such as health, family relationships, wardrobe, skills, education, automobiles, and so on, as well as currency-related capital like home equity (when they have it) or to run up credit cards. The 2008 financial crisis in the USA can be seen as an inflection point as US workers in general reached the point of eroding their home equity close to zero as they struggled to keep going at the level of consumption they had come to expect in US society. But ratcheting down their consumption levels just made the financial crisis worse. Our world has the physical capacity for everyone to have a very nice life materially. But our mainstream economic dogma emphasizes competition and an income-through-jobs link. That pretty much ensures most people will suffer needlessly as our labor-based economy continues to implode in many areas. This creates a vast amount of social stress in a society. That effect is strongest in the USA right now. But in the absence of broader socioeconomic changes, it will spread to other countries as they too go through the curve of increased technological capacity. Even China is starting to automate heavily due to issues about rising wages and issues about increasing expectations about quality. Countries that have better social safety nets (like universal health care and broader social welfare and more public investment in infrastructure and social programs) will have more resiliency in the face of economic problems, but even those conventional programs as-is, that still assume such social assistance is "temporary", may not be enough to deal with the huge changes ahead. Eventually, the balance will change in one of several ways. Here are three possibilities. People might engage in a political struggle leading to broad changes and broader equity in global resources (which is what is going on in some parts of Europe right now, as in the past). Or, some compromise might be achieved where lots of make-work is created (through needless wars-of-choice, endless bureaucracy, endless schooling, expanding prisons, or widespread avoidable sickness) that props up the income-through-jobs link (which seems to be the path the USA is going in part). Or poor people might essentially be starved to death or worked to death, and the remaining wealthy people will, among themselves and their robots, essentially produce a new society of the remaining people that is based on a new paradigm of broadly shared wealth (there are aspects of this that have been going on for a long time in the globe). That last option would be ironic because the robots, in combination with the material resources of the solar system, could just as easily produce wealth for quadrillions of people as for millions of people, and a bigger society is probably going to be more interesting. In practice, we seem to be seeing a mix of all three of these approaches. Which one will dominate long-term remains to be seen. Also, there may be other possibilities, of course. Given the potential of technology as an amplifier, including through WMDs like nuclear bombs, robotic drones, and biotech plagues, it is possible that everyone will lose if the overall social stress level gets too high. I have devoted most of my personal resources to trying to prevent that, as have many others. As Bucky Fuller has said, whether it will be Utopia or Oblivion will be a touch-and-go relay race to the very end. For good or bad, it is a very "interesting" time to be alive. Our individual decisions may very well tip the outcome one way or another. 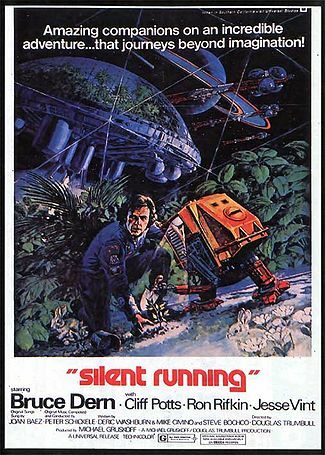 The Silent Running movie poster from 1972. I saw Silent Running on TV a couple years later and it made a big impression on me at around age ten. The robots there were amazing and inspired R2D2 in Star Wars as well as my own creations. In the movie, almost all of Earth's plant life that was not paved over gets blown up by nuclear explosions. This happens because almost no one cares about forests and gardens and diversity anymore and the forest are deemed just too expensive to mantain "in domed enclosures blasted somewhere out in space". That movie (also a reflection of the culture at the time) set the tone for much of my early career with work and study in robotics and ecology. In a way, it influenced even my marriage to someone who loves nature and our eventually living with with our child on about fifteen acres of forested land in the heavily forested six-million-acre "Forever Wild" New York Adirondack Park. That might be a nice ending, except the nukes (and similar) are still out there ready to launch for ironic political or technical reasons. And so I continue to work towards software for sensemaking and community (instead of software for robot caretakers, as fun as that would be to write) out of continuing hope that we can somehow still avoid an even worse fate than the one predicted in the movie where at least "... there's hardly any more disease. There's no more poverty. Nobody's out of a job." Still, that challenge will no doubt be an unending struggle for endless future generations to preserve diversity while still making things great for most people who may not always get along that well and value different things. One could hope our robots, information management software, and other systems we create could help us with that more than hurt. Still, as a worrier, I can now worry about Eliezer Yudkowsky's quip on "Moore's Law of Mad Science: Every eighteen months, the minimum IQ necessary to destroy the world drops by one point." While I may not agree 100% with that quip, it certainly captures a sentiment about a continuing trend related to technology and society. To me, that is another good reason to expand human civilization into space like through self-replicating space habitats, while at the same time trying to increase our collective social intelligence and sense of social justice to try to avoid the destruction of human and other life on Earth. And fortunately there is a lot of synergy between those two goals, since technologies needed to live well in space such as recycling and advanced manufacturing and robotic agriculture could help a lot in creating abundance for all on Earth. 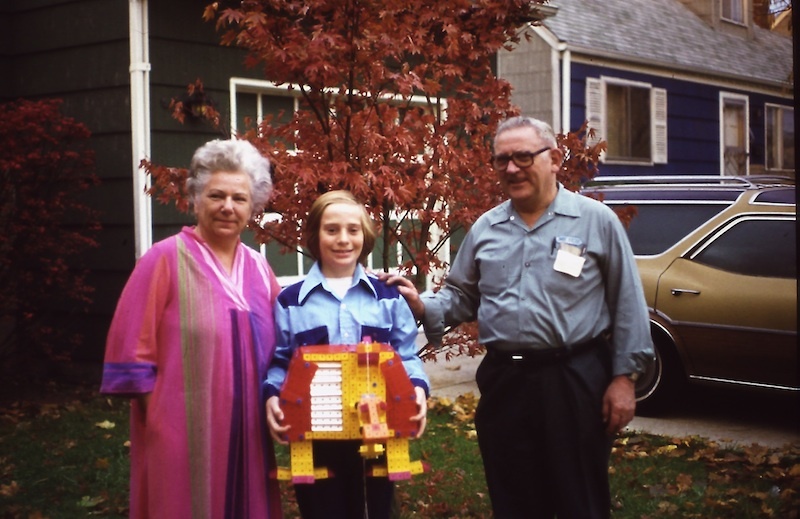 Me around 1976 with my parents and a model of a Silent Running Drone robot made out of Togl's. The arm and gripper could be actuated by strings and a bellows. 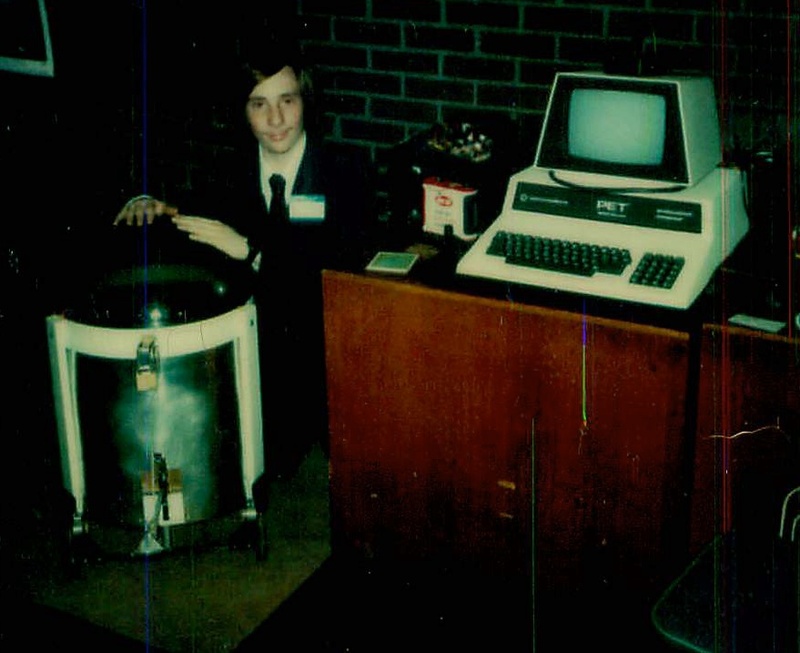 Me with one of my line of ROSCOE (Remotely Operated Self-Contained Operational Entity) robots at the Robotics Futures Expo in 1980, where Isaac Asimov called me a "Rotten Kid". :-) ... Luck, resources, and encoragement includes having a helpful father who knows how to use machine tools to get a gripper and some brackets made -- though I did the electronics, programming, and much of the scrounging myself. That's a rolling bar with an upside down salad bowl on top. The gripper design is taken from a triple-fingered sugar cube tong (my father machined it at work on his lunch hour). The robot could repeat patterns of motions input through a joystick, and could also be directed to do motions via typed commands in English and German. Out of the blue, an earlier version (predating R2D2, but similar looking) had won a Navy Science Award at a local science fair (maybe in part as I described it as a "nuclear material transporter" inspired by something I saw at Brookhaven National Labs' nuclear reactor, and the Navy encourages nuclear sorts of things -- so began my first unintentional ambivalent entanglement with "National Security". The relays sometimes would stick and overheat and start to smoke and I'd have to bang the interface box to unstick them, but at least the opto-isolators (carefully sorted through from from Radio Shack packages to get the rare higher current ones) kept the computer safe from other mistakes. The Radio Shack stores in the area seemed to recognize me and my father as a pair, going in to buy various parts. Not that there is anything really very expensive in the robot system, other than the PET computer. Still, it would not have been possible without my father's help and involvement. Thanks, Dad, for helping me realize some of my dreams. I hope you are on to better things. And I can also thank various school teachers for help along the way, too, especially Jack Woelfel (who also had a computer company and loaned me PETs), Joe Maurer (who let me in early to use the school computers), David Gray (who stayed after to run the computer club), and Dr. Farabaugh (who taught the junior high science class I built a first robot for). What is next to dream, design, and to build? Unfortunately (or fortunately? ), my robotics career sort of derailed in the late 1980s alongside the AI winter, when I foolishly left a good job managing the Princeton Robotics lab, and then had repeated problems at graduate schools trying to get a PhD related to space habitats. I also got more involved with computer graphics and desktop software (which are just cheaper and easier to work on, and I never was much of a machinist). And I also got more involved with organic agriculture, gardening, and ecology. I've mainly been writing, thinking, reading, and programming ever since, especially in relation to understanding nature, technology, and society. Sometimes I really miss the hands-on robotics work. The Open Skutter Project is a recent idea of mine, but I don't have much time/resources to pursue it, except maybe a little for fun with my kid someday. The economic, social, and security issues raised by robotics and other automation have still long been on my mind (along with issues related to better designs and, now, voluntary social networks). I have written a lot about those things like with the links in the next section. So, robotics has continued to play a big part in my life, indirectly. And certainly the confidence of some early success in dreaming and doing has been useful, even when later (harder) things haven't worked out or have taken a long time to realize. These are some writings I have made over the years. * "rethinking work to be play". Essentially, here is the beginnings of an index into all the details and links to other people's writings to show why I believe these things. Each email or essay was written as I developed my understanding of these ideas over the past decade or two. And each was generally written to address some issue someone else raised on a mailing list, and I replied to each in isolation. So, here are many of those replies in one place. The first essay was written earlier, and is more abstract and theoretical. The second essay was written afterwards, and is more specific to Princeton University and also is a bit of a memoir about personal growth. The third is a condensed version of the second with most of the personal and Princeton-specific comments removed. Here are some more general comments about post-scarcity and academia. And here is information about a couple ventures I tried to bring together after PU graduate school under the name of Sunrise (both as a non-profit and a for-profit); both fizzled, but there is also information there how those ideas scaled down to what I have done recently. * Basic Income from a Millionaire's Perspective? is not necessarily to succeed. The first essays are about education in part because that is what I have been doing for years, educating both myself and others about these "powerful ideas". Plus most people in the world might enjoy seeing the flagship of global capitalism run into an iceberg. :-) As long as there are stylish lifeboats for all. The Pointrel System is an RDF-like triple store implemented on the Java/JVM platform, supporting related social semantic desktop applications to create, use, exchange, and organize informational resources for a reasonably joyful and secure world. I am concerned about how our society can transition from a scarcity-oriented one to a post-scarcity one in a non-violent way that brings abundance for all globally. One major thing I am concerned about is post-scarcity technology (like nuclear, biotech, nanotech, robotics, AI, communications, bureaucracy) wielded by people still focused on scarcity issues. I have been programming for three decades, which generally has been how I have earned my living. In the 1980s, I became more interested in ecological issues, in part through interacting with people in a local Unitarian Universalist Social Concerns Committee in Princeton, NJ. I was program administrator for the Natural Organic Farmers Association of New Jersey for one season, and did other organic agriculture related things (volunteered at an organic farm, worked as a cashier at an organic foods store). That non-profit work led to writing a (free) garden simulator to help people better learn to grow their own food. http://www.gardenwithinsight.com/ That was a labor of love by my wife and I, and beyond prompting me to go to graduate school in Ecology and Evolution (where my wife and I met), it took over six person years to complete. It could still be vastly improved. Working on our own, we only scratched the surface of what is possible. The ironic disclosure in the essay above on "financial obesity" is that in the process of trying to dig ourselves out of the vast amount of money we borrowed for living expenses to finish our free garden simulator project (we did it, but it took years of working for IBM Research and others afterwards), I helped my wife develop decision support tools to help decision makers see issues from multiple perspectives. This included supporting business decision makers, non-profit decision makers, as well as national security analysts for multiple governments. But helping prevent more of that was part of the whole point (at least on our side). A favorite related quote from Manuel DeLanda is from: "Meshworks, Hierarchies, and Interfaces"
"To make things worse, the solution to this is not simply to begin adding meshwork components to the mix. Indeed, one must resist the temptation to make hierarchies into villains and meshworks into heroes, not only because, as I said, they are constantly turning into one another, but because in real life we find only mixtures and hybrids, and the properties of these cannot be established through theory alone but demand concrete experimentation. Certain standardizations, say, of electric outlet designs or of data-structures traveling through the Internet, may actually turn out to promote heterogenization at another level, in terms of the appliances that may be designed around the standard outlet, or of the services that a common data-structure may make possible. On the other hand, the mere presence of increased heterogeneity is no guarantee that a better state for society has been achieved. After all, the territory occupied by former Yugoslavia is more heterogeneous now than it was ten years ago, but the lack of uniformity at one level simply hides an increase of homogeneity at the level of the warring ethnic communities. But even if we managed to promote not only heterogeneity, but diversity articulated into a meshwork, that still would not be a perfect solution. After all, meshworks grow by drift and they may drift to places where we do not want to go. The goal-directedness of hierarchies is the kind of property that we may desire to keep at least for certain institutions. Hence, demonizing centralization and glorifying decentralization as the solution to all our problems would be wrong. An open and experimental attitude towards the question of different hybrids and mixtures is what the complexity of reality itself seems to call for. To paraphrase Deleuze and Guattari, never believe that a meshwork will suffice to save us." I spent part of last year building an open-source web application for story sharing and sensemaking in small groups. It's called Rakontu. This was a dream that began in 1999 (when I first started working in organizational and community narrative) and has been growing ever since. I used up years of savings to do it, and I was able to build far less than I would like to build someday, but I had a grand time and I'm glad I did it. I wrapped up the project about a month ago and posted an excerpt from a lessons-learned document for the project. * The need for FOSS intelligence tools for sensemaking etc. I'm slowly making some related efforts with the Pointrel System, to try to integrate her ideas and others (like about structured arguments). We had discussed her using the Pointrel System for Rakontu when she started (which was, as usual, a work-in-progress), but decided that Google App engine would be a more widespread and well-supported platform for Rakontu (including providing free hosting). I instead worked independently on an evolutionary music application for the Android called Musical Phrases. That turned out to be a bit of a mistake for a few strategic reasons, including lack of synergy and lots of frustrations with a work-in-progress Google App Engine (though App Engine seems to have improved lately). At the moment, for want of a better name, I'm calling the combined system "Twirlip" but it is more a dream than a reality right now. The entire internet is more like an early version of Twirlip. :-) And Twirlip is a pretty pessimistic name. :-) Twirlip was right, but Twirlip was not listened to. While I like the evolutionary music ideas (similar in some way to PlantStudio), I can see my interests are more in creating (and using) text-heavy information management tools bordering on collective AI, and always have been. Although, somewhere along the way I've become sort of an expert in post-scarcity issues, and that has mostly eclipsed my programming -- even though it has been through my thirty years of experiences with computers and robotics (and other things), and watching those fields change, that has been what has given me confidence to write about post-scarcity things. Just not enough hours in the day to do everything I want to do. As with that notion of "mutual security", the US intelligence community needs to look beyond seeing an intelligence tool as just something proprietary that gives a "friendly" analyst some advantage over an "unfriendly" analyst. Instead, the intelligence community could begin to see the potential for a free and open source intelligence tool as a way to promote "friendship" across the planet by dispelling some of the gloom of "want and ignorance" (see the scene in "A Christmas Carol" with Scrooge and a Christmas Spirit) that we still have all too much of around the planet. So, beyond supporting legitimate US intelligence needs (useful with their own closed sources of data), supporting a free and open source intelligence tool (and related open datasets) could become a strategic part of US (or other nation's) "diplomacy" and constructive outreach. As Bucky Fuller talked about with Comprehensive Anticipatory Design Science: "Think of it. We are blessed with technology that would be indescribable to our forefathers. We have the wherewithal, the know-it-all to feed everybody, clothe everybody, and give every human on Earth a chance. We know now what we could never have known before -- that we now have the option for all humanity to make it successfully on this planet in this lifetime. Whether it is to be Utopia or Oblivion will be a touch-and-go relay race right up to the final moment." "Sustainable and Lifecycle Information-based Manufacturing Program"
And there are thousands of people doing independent stuff, many of them young and eager to build a better world through "open hardware" and "open manufacturing" and even "DIY Biotech". "Build 21000 flexible fabrication facilities across the USA"
"H.R.6003 -- National Fab Lab Network Act of 2010 (Introduced in House - IH) by Rep. Bill Foster [D-IL14]"
"(3) to seek to establish at least one Fab Lab per every 700,000 individuals in the United States in the first ten years of its operation." But it looks like, at least in the USA, individual efforts will surpass things government fosters, which, in the case of DIY biotech that could benefit from reliable local containment, is a bit problematical. "Safety of DIY-bio (was Re: Fwd: Meredith made AP)"
Our ossifying formal social processes in the USA, mired in partisan gridlock, do not seem able to keep up with the rapid pace of technological and social change. And so individuals and societies end up doing things in risky ways that are not strictly necessary given all the great abundance in our society. If ten years ago teens could make computer viruses at home, and if in twenty years or so, bullied and alienated teenagers will be able to make plagues in their garages, then what are we going to do when, perhaps, in a hundred years teens can make black holes in their basements? We need a new vision of society, or the people will perish. That's quite a challenge, obviously, but it is happening; the only issue IMHO is how we as a community decides to relate to that trend. As I see it, we are in the end game of global-capitalism-as-we-know-it, if only due to 3D printing. This all suggests that our biggest danger as as society is in putting the *tools* (some being useful as weapons) of a post-scarcity civilization into the hands of scarcity-preoccupied minds. (Especially ones following outdated military dogmas like unilateral security instead of mutual security.) As Albert Einstein said, with the advent of atomic weapons, everything has changed but our thinking. This site is put up towards that end, changing our thinking, through helping change our collective mythology, especially in the non-profit sector. * Burdened by Bags of Sand. These changes in thinking may be big sometimes, and they may be small sometimes. For example, here is an essay and book review about the "The War Play Dilemma" showing how this issue of how we address conflicts is woven into our parenting and play. More than anyone, I need to thank Cynthia Kurtz, my wife for more than twenty years, for helping make me a better person by putting books and ideas in my way (like Zinn or Loewen or many others), and also for her boundless patience and generosity in giving me time to write all this. More about me: Around 1998, my wife and I released three pieces of educational software which are still available at our original web site. You can also read about the history of these pieces of software. I worked for IBM Research and also at IBM's Internet Media Division as a contractor for a while afterwards. For about a decade I was a part-time stay-at-home Dad (trading off with my wife), and spent my idle time writing email and essays like these, as well as developing free software. Now most of my time goes into full-time work for others while my wife does more free work and homeschools our kid. I have been working on the OSCOMAK, OpenVirgle, Pointrel, and PataPata projects. I've posted a lot to the Open Manufacturing list. I also have posted stuff on sustainability, space habitats, F/OSS issues, and programming to various news groups, as well as slashdot and elsewhere. You can contact me at pdfernhout at kurtz-fernhout.com . Including "Paul" in the body of the email will help bring it to my attention. Also, feel free to quote short sections with linked attribution in emails or on web pages. Note that I sometimes include material (quotes) I consider covered under "fair use" -- whether that material's inclusion can still be considered "fair use" in derived works in other contexts outside this site is a potential issue for such future authors to resolve for themselves. Note: no license ever grants permission to modify text a person wrote, or to selectively quote it, in such a way as to intentionally misrepresent what a person said and then attribute the changed text back to them. There are other laws and ethical principles that cover that kind of stuff. Since most of the stuff here represents my opinions, it might take some rewriting to make them yours :-) or to make them into something more abstract.